Wines have to be left decanted for at least an hour to breath, so that it tastes its best. But, rarely we have that much time to spare or most often we forget to do so. May be sudden entry of guests won’t give you much time to prepare your wine. So here is a best option for you. Rouge 02, an electronic wine breather, which amazingly reduces the breathing time from 2 hours to one minute and that too in a very controlled and stylish way. It works on the wine by slowly releasing the bubbles with the perfect flavor and perfume of the wine. The Rouge 02 operates on three x AAA batteries, which is sufficient for 230 bottles of wine. There is an automatic mechanism, which will ensure perfect breathing time for your wine. 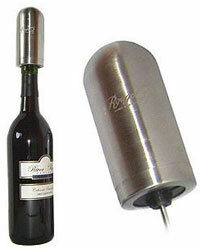 It is a stainless steel electronic wine breather and approved and tested by wine industry. The cost of this wine breather is £19.99 excluding the batteries. 3D Chess Board – Game on!